Should Bleacher Maintenance Happen Just Once a Year? In 2012, there were an estimated 26,700 bleacher-related injuries, with 5,620 of these involving children under 15 years old. Five of these children died as a result of these falls. All of these incidents resulted from a person falling from or through bleachers onto the surface below. Federal legislation to tighten safety guidelines has not been universally supported, meanwhile, bleacher-related injuries continue to mount. In order to guard against the dangers of faulty bleachers, an annual yearly inspection is required. The Consumer Product and Safety Commission (CPSC) guidelines recommend conducting regular inspections no less than four times a year with documentation included that provides a date and signature of the supervisor performing the inspection. According to the CPSC, the objective of regular inspections is to "identify any structural damage or degradation that could compromise safety." 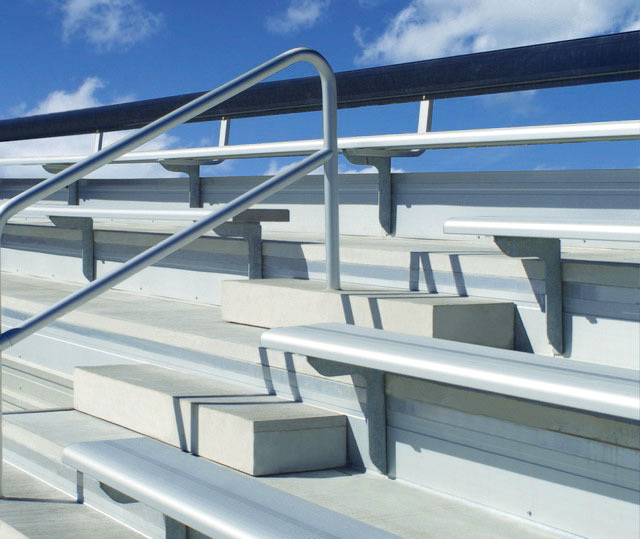 Keeping spectators safe by having regular bleacher maintenance and inspection performed is a first step in preventing accidents and liability issues. Toadvine has an experienced and knowledgeable team of inspectors who know code expectations, and guidelines for inspecting bleachers. Prevent accidents and injuries by having our experienced team of inspectors take care of your bleacher inspections and maintenance year-round. Make sure stairs, ramps, and aisles are dry, clean, and free of debris. All stairs should be equipped with handrails and tread to prevent falls. Loose flooring should be fixed to prevent tripping hazards. Seats should be free from splintering wood and loose screws and hardware. Safety rails should be installed on the back of bleachers to prevent falls. If your bleachers are overdue for routine maintenance, contact our maintenance department we'll set up a time to come to your facility. Toadvine Enterprises is here to help your schools and organizations provide a safe environment for fans, spectators and players.